Happy 2nd Birthday Sweet Angel Baby Kathryn! Happy 2nd birthday sweet angel baby Kathryn McKay!! We have had the opportunity to celebrate Kathryn's second birthday. How quickly time has passed but how slowly it has passed was we all so desire to be with her again. I am slow to post this but wanted to recognize Kathryn and the tremendous blessing she was and continues to be in our family. 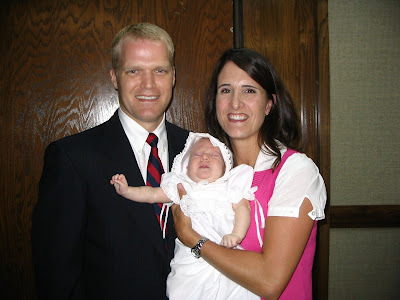 I chose to post some pictures from the day she came into our family 02/21/07 and her blessing day. Two pretty significant days. I have included pictures of each of the children with Kathryn just moments after they met her. We had Kathryn at 6:30 in the morning so the kids went all through school before they were able to meet their brand new sister. They were so excited and could hardly wait. John wanted to bring them back that morning, but I was up throughout the night with labor and wanted to sleep when I could. As you can see from their faces, they were more than thrilled to meet her and hold her. This past January we sat down as a family to set some goals. 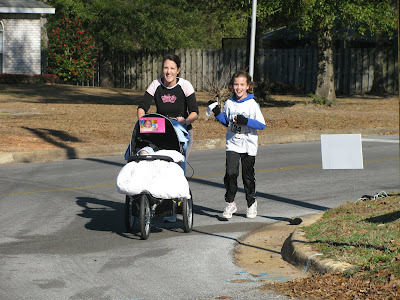 One of the goals that both of the girls had was to run a 5K. Now this was something that Caroline completed last year but she wanted to do another 5K and this was a new goal for Julia. Sterling just wanted to do a fun run (1 mile). 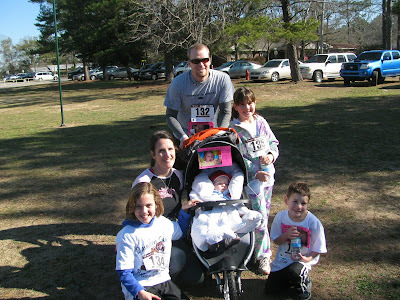 As we were looking at the races in the area, we noticed there was a 5K on Kathryn's birthday. What great gift to give to each other and to her! So we decided we would sign up and run the race. We didn't have much preparation time as I spent time in Missouri but after I got back, we spent some time at the track that is just down the street from our house. 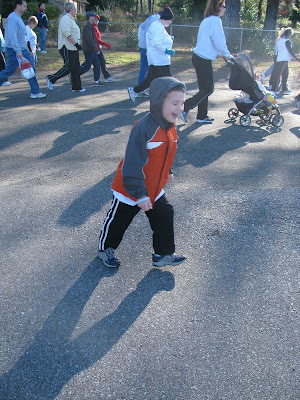 Sterling and Julia would run/walk the 3 miles while Caroline kept running and running. 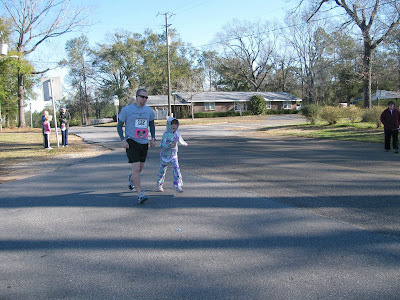 One of the days she was running, she ran 6 miles and wanted to run more but I made her stop. I was concerned she would injure herself and she would not be able to run the race. We got to the race with only 5 minutes to start which was not good for warm ups or for actually starting with the pack. But we made due. I took off pushing Andrew and running with Caroline while John stayed with Sterling and Julia. Caroline was able to improve her time from December by about a minute. She was pleased but bummed that it was not as fast as she wanted. Julia and Sterling completed the race which was great. Julia had one of her good friends join in on the race at mile #2 which totally helped her along the way....Thanks Emily!! Sterling spent quite a bit of time on John's back as he would run as hard as he could and then was much too tired to walk any further. In order to keep up, John hauled him. John's brother and his family, his parents, and our dear friends the Nelson's came to cheer us on. It was a great way to start the day out. The start of last week Andrew started coughing, sneezing, eyes watering....the whole nine yards. On Wed we went for a well check and we thought he might have RSV. However, because it was a well check they could not screen him for RSV. So on Thursday we went back as his cough had progressed, had a rattly chest, and was just not pleasant. They swabbed his nose and YEP it was RSV. He received a breathing treatment at the office and they sent us home with breathing treatments to done 3 times a day plus an antibiotic to make sure his RSV/Broncholitis did not turn south into pneumonia. Needless to say he has been a great sport. Most of the time he just sits in my lap without fusing for the duration of the treatment. He is sleeping in his carseat as it is more upright than his crib and I have been sleeping on a mattress on his floor. So we are looking forward to him feeling better and me moving back into my own bed! We follow up on Wed with his physician. Don't you just love Sterling's "eyes". The girls have sleep masks that we call "their eyes". Sterling has always wanted a pair. However, I was unable to find a pair that were boyish until this summer. We found these this summer and I knew they were a keeper. Yes they may be made out of satin but they are BLUE and have a GREEN frog on them. Sterling loves them. He doesn't wear them very often because they are usually lost between his bed and the wall. But when he does find them he stores them on Mater's eyes (his night light at the side of his bed).